G.P. Putnam's Sons, 9780425261279, 448pp. 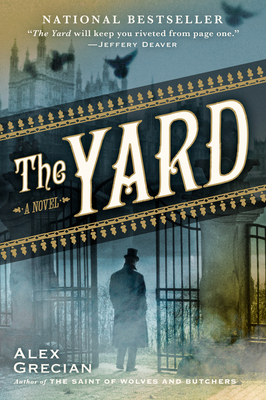 As Jack the Ripper’s reign of terror in London comes to an end, a new era of depravity sets the stage for the first gripping mystery featuring the detectives of Scotland Yard’s Murder Squad. A Scotland Yard Inspector has been found stuffed in a black steamer trunk at Euston Square Station, his eyes and mouth sewn shut. When Walter Day, the squad’s new hire, is assigned to the case, he finds a strange ally in Dr. Bernard Kingsley, the Yard’s first forensic pathologist. Their grim conclusion: this was not just a random, bizarre murder but in all probability, the first of twelve. The squad itself it being targeted and the devious killer shows no signs of stopping. But Inspector Day has one more surprise, something even more shocking than the crimes: the murderer’s motive. Alex Grecian is the national bestselling author of the contemporary thriller The Saint of Wolves and Butchers, the novels of Scotland Yard’s Murder Squad, including The Yard, The Black Country, The Devil's Workshop, The Harvest Man, and Lost and Gone Forever, as well as the critically acclaimed graphic novels Proof and Rasputin. Grecian lives in Kansas with his wife and son.